Home » Blog & News » Sierra Leone Mudslide: How Can I Help? Over the weekend, three days of torrential rain caused massive flooding in Freetown, the capital of Sierra Leone. On Monday, August 14, a hillside on the outskirts of Freetown collapsed, creating a mudslide that swept over at least 100 homes. 400 people are confirmed dead, with 600 still missing and thousands homeless. At times like this, the first question for many is, “How can I help?” For those who want to help, here’s what you need to know now. 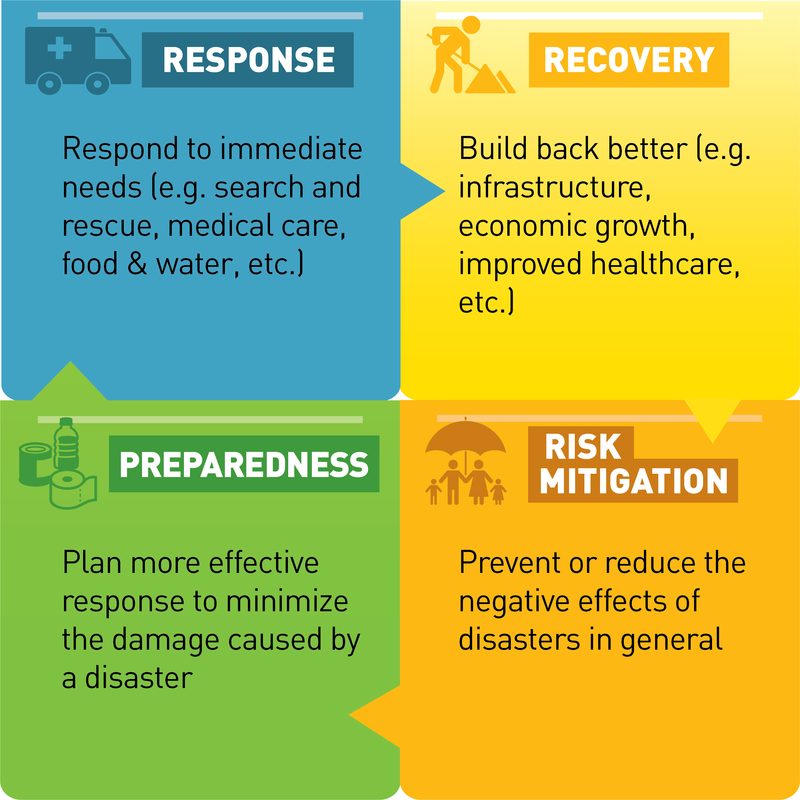 There are four phases of disaster relief: response, recovery, preparedness, and risk mitigation. We are still in the chaotic first phase when needs on the ground are still being assessed and the primary focus is on immediate search and rescue operations. This is extremely challenging work that requires the specialized expertise of first responders who have experience in similar disasters, and/or have resources already on the ground that can be mobilized immediately. As a clearer picture emerges of how philanthropy can help, we will update this post over the coming days and weeks. In the meantime, here are three tips to keep in mind to ensure your giving has the greatest possible impact. 1. Resist the impulse to donate items; send money of any amount instead. Many people are moved to donate items such as food, clothes, or blankets. While well-intentioned, such donations frequently don’t match what is actually needed and can risk taxing precious logistics and storage capacity. For a more in depth explanation of this, listen to this Business of Giving podcast with Kat Rosqueta (start at 11:43). 2. Think top down and bottom up. The large, international aid organizations and specialized first responders can tap into global networks and supply chains that allow them to bring resources quickly and at high volume. For example, World Vision announced Thursday they will distribute 4 million water purification tablets to prevent an outbreak of deadly waterborne diseases like cholera. The United Nations World Food Programme is distributing two-week rations of staple foods to people in the region, including survivors and first responders. Large international aid organizations like Save the Children, World Vision, and Unicef, which have experience in disaster relief and already had familiarity with the situation on the ground (due to the Ebola crisis), are particularly well-positioned to act. Although they take longer to identify, local organizations have critical knowledge and networks that allow them to quickly assess changing priorities and get help to many of the most vulnerable groups faster. We are reaching out to our contacts in the region and will update our guidance as we learn more. When giving to local organizations, donors will do best to find a trusted source with on-the-ground knowledge that can vouch for an organization’s legitimacy and efficacy. In a situation where international funds are flowing in, many new organizations may suddenly appear, and not all will be legitimate. 3. Help is needed way beyond the first stage. After the critical first 72 hours, attention has shifted from a focus on search, rescue, and emergency medical care towards addressing the immediate needs and security of survivors – especially since the rainy season in Sierra Leone extends into September. Even after these immediate, basic needs are met, Sierra Leone will need continued support to rebuild and recover. Each phase brings different needs and different players who will be positioned to provide the best help. Although giving in disaster situations tends to decline after the first few days, often funders can have the biggest impact by paying attention long after the initial headlines fade. With this in mind, organizations like Global Giving have set up pooled funds, which can channel funds to local grantees once medium and longer term needs have become clearer. Organizations like the Center for Disaster Philanthropy specifically do not disburse funds until after doing an on-the-ground needs assessment three months post-disaster. Of course, many international development organizations as well as local groups are likely to play key roles in the long term recovery process, and some of the funds they gather in the shortterm may be used in longer term work. We will continue to post updates on this disaster and ways to help as we learn more. Sign up to receive emails with our latest blog posts.